My LIFE from 6th grade to 17th grade (I red-shirted my senior year and started my Masters) was TEAM sports. Being part of a TEAM is a special and unique animal. There are amazing highs, when things gel and are going well, nothing beats the feeling of happiness and camaraderie. I am BLESSED to have a TEAM of lady Runner friends... 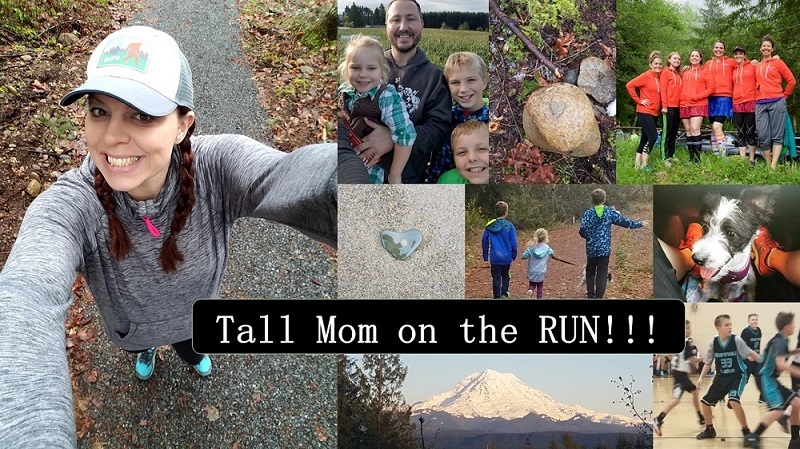 I am EXCITED to be a part of a new TEAM this weekend... My Hood to Coast Nuun Team HERE is chalked full of amazing Female Bloggers. This weekend we went to visit my in-laws. Poor Little Stud #1 was not feeling well and lost his tummy on our hike :( We were in the car a lot and pretty busy. When we got home on Sunday I was WIPED... So I decided to watch Hood to Coast the Movie to Inspire my tired-self to go out the door. I set out around 7:15PM, and Muscle Man warned me it would get dark around 8pm.. I went solo on the trail, which I generally do not do.. I have not felt great about my HTC training, barely making weekly mileage over what I will be running in my 3 legs this weekend. I know I will finish the miles, but with speed? A bit concerned about that. I set out SPEEDY with a 7:40 pace, WOW where did that come from?? I knew that was a little fast so I held back..
7:53 pace- this would get me a Half Marathon PR, cant believe my first half is still my fastest..
8:18 pace- I still cannot believe I ran an entire Marathon at this pace, wowzers..
Lots of bikers no runners. It would be hard to talk and bike fast. It is getting dark and spooky.. UGH!! Last mile 7:47!! Overall pace 7:56 and I made it back to my car safely.. 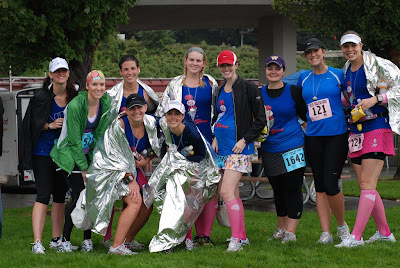 So EXCITED to run Hood to Coast, regardless of pace I will have a blast..
Tell me about a time you were a part of a TEAM. I was a band geek. Never really finding the confidence to do team sports and being a control freak kept me out of most sports in highschool. I loved running and swimming but being in the band was a lot like being on a team. I loved the sound of the whole group and creating something greater than myself! That is one speedy Sunday night run! Awesome idea to watch the movie for runspiration. The whole team is going to have a BLAST! I can't wait to hear all about it. I am so excited to a part of this, too! I also have a long history of and real affinity for being a part of a team…4 different sports in high school and then 15 years of rowing. That is one thing I really miss now that I seem to be running and biking alone almost exclusively. Now I need to pack! I did lots of team sports since I was itty bitty and that is why running is so strange for me. No one but myself to take credit or blame! I am so excited for you all to do the relay, it should be an amazing and super fun experience! I also think being a family is a lot like being on a team, just thought of that! I was big into softball, so being part of a team was an experience for me growing up. I bet being part of a running team is fun! I guess my running partner and I make a team of two? Hehe. Sorry to hear about LS1. I've been having similar stomach issues all weekend (started Friday night) and my run today suffered as a result :( I hope he's feeling better! Congrats on your speedy run! Btw, I got my Active Band in the mail this afternoon. That has made my day a whole lot better! Thank you!! It sounds like you are in for one heck of a weekend. I look forward to reading your recap! I have already been inspired to find someting similar! It sounds like the experience of a lifetime. I ran XC in high school and loved it since it was all about running together. Scoring is based on your place and the top 5 runners in are the scorers, so lowest score wins the meet. We had to encourage each other to push it, but we all had bad meets and the other girls were there to back you up. I have since coached XC and there is nothing like the bond of a XC team. I can't wait to read to follow your adventures! Ahhhh, high school cross country. I miss it SO much. It was the only "team" running I ever did, and it was how I fell in love with running. Ever since high school, I've done almost all of my running solo. My friends all think I'm crazy. I loved the spirit cheers, rooting each other on, the singlets (seriously wish I would have "taken" one for a token), and the camaraderie. Although I wasn't the fastest senior girl, I was chosen as captain my senior year because I got along so well with everybody. I've been considering finding an "adult" cross country team.